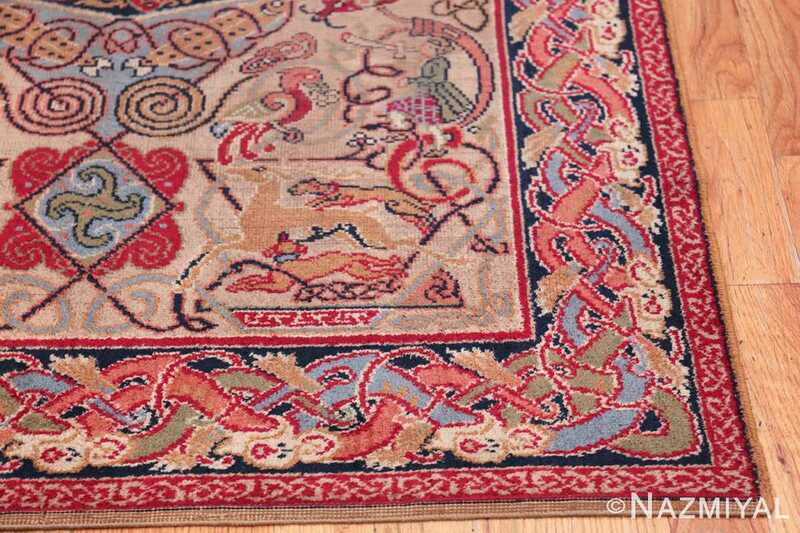 Breathtaking and Extremely Artistic Small George Bain Celtic Hunting Rug , Country of Origin / Rug Type: Irish Rug, Circa Date: Mid – 20th Century – This classic Celtic rug by George Bain represents an important part of Scottish history. 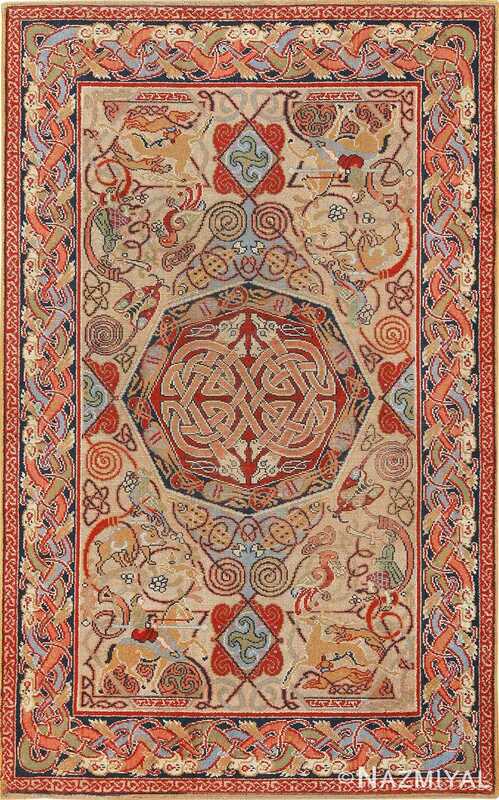 His work is largely responsible for the vintage mid 20th century revival of ancient Celtic art. 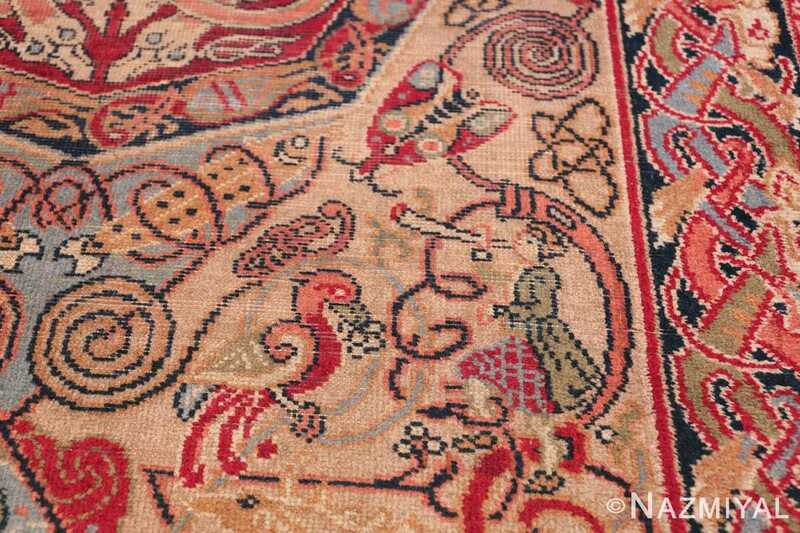 Many of his pieces are revered for their historical significance and are considered a part of Scottish National Heritage. Drawing from medieval Celtic manuscripts, this intricate hunting scene rug brings a hunting scene to life using classic Celtic symbolic motifs throughout. 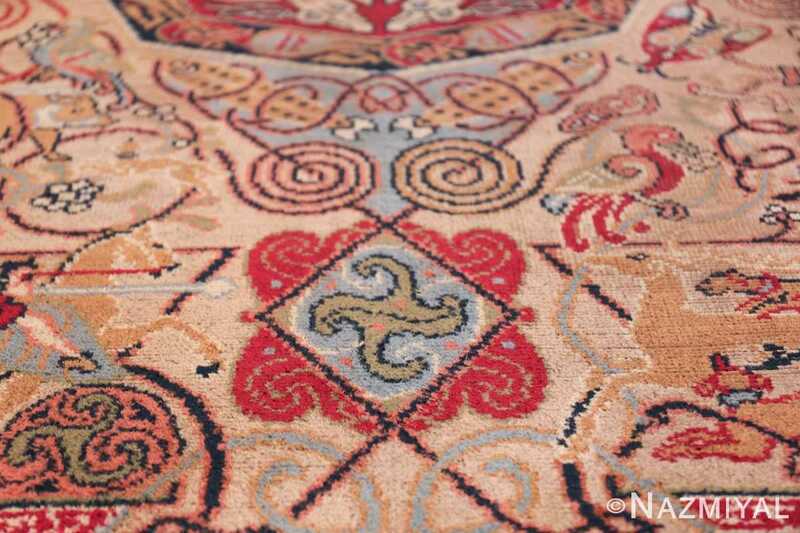 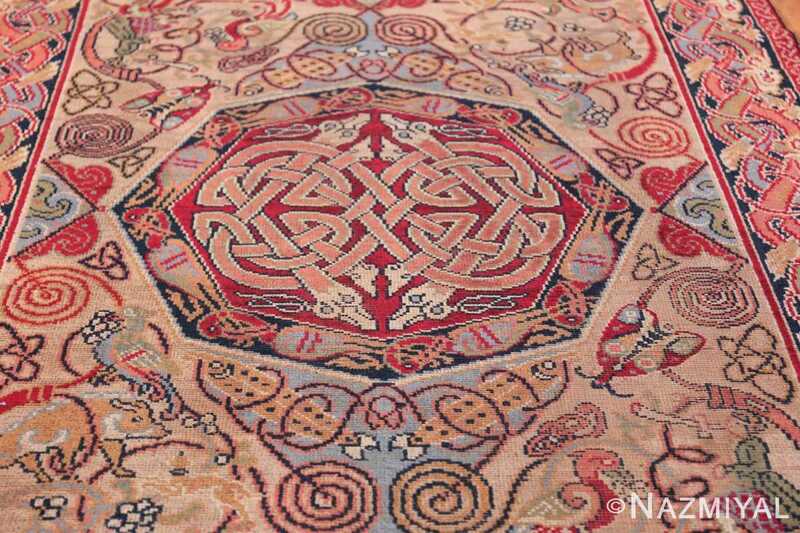 The central design of the Irish Celtic rug uses Celtic knot work as a central medallion. 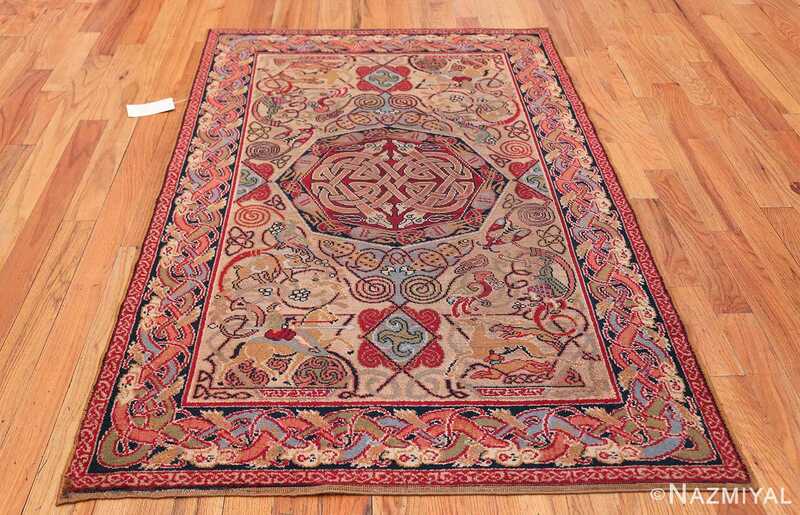 It is divided symmetrically both horizontally and vertically, giving it a sense of balance. 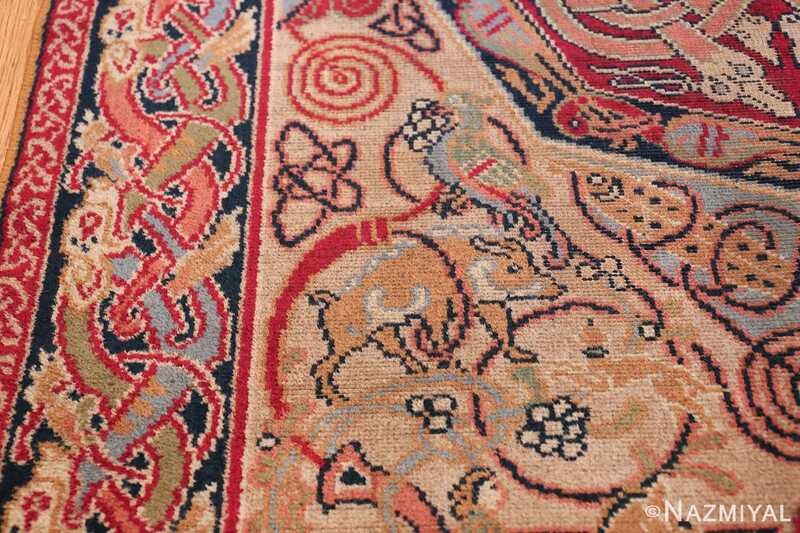 The border consists of a fascinating rendition of animals intertwined, drawing inspiration from the historical Pictish School of Celtic art throughout Scotland. 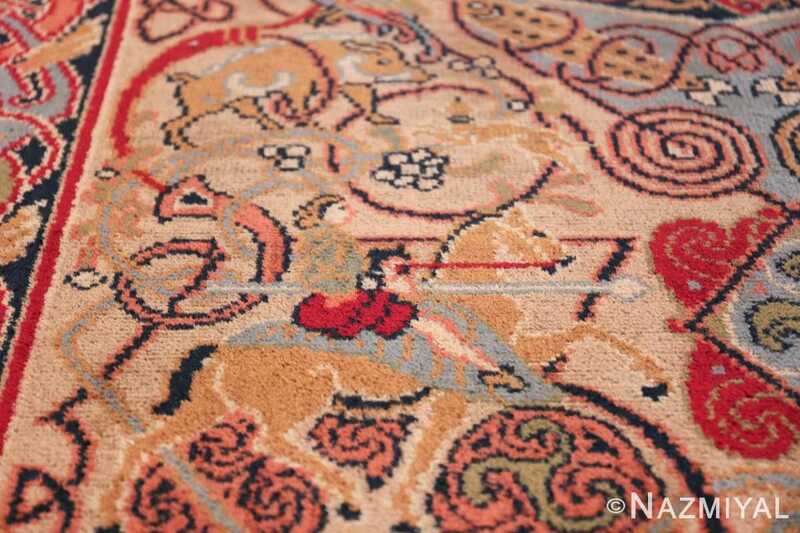 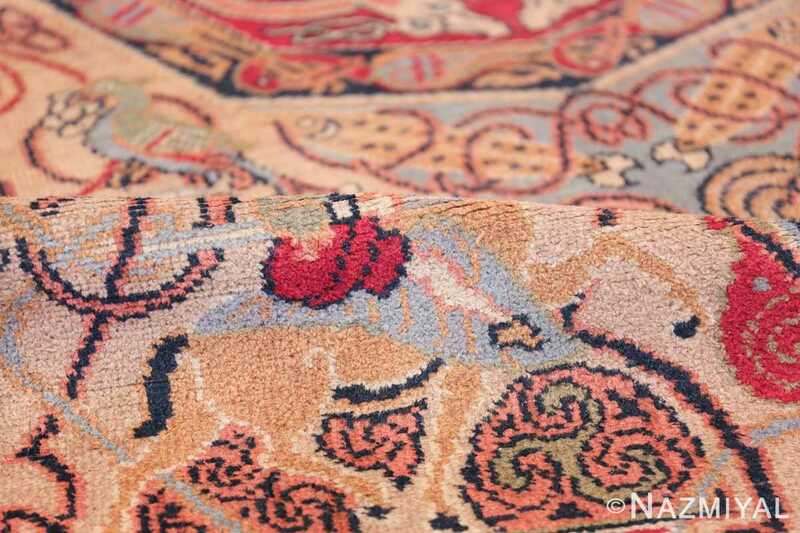 This small George Bain Celtic Hunting rug showcases coursing hounds and hunters make their way in search of the prize. 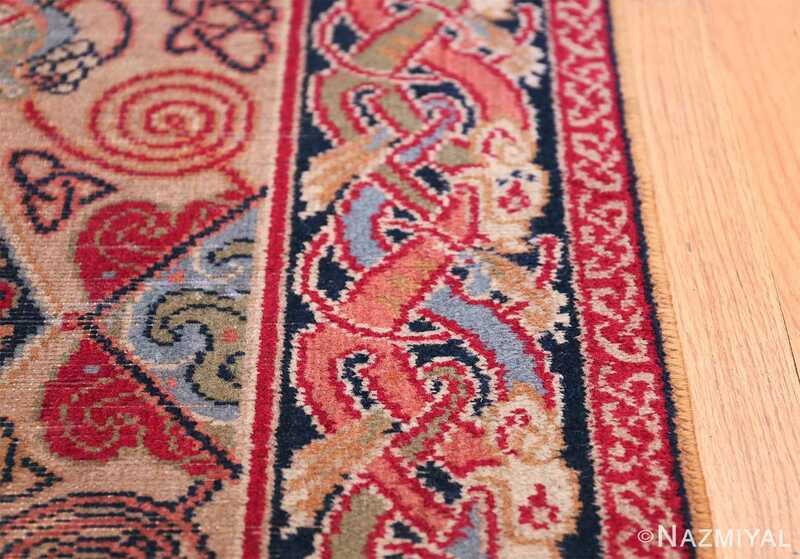 The Irish rug features shades of reds, blues, greens, and ivory on a cream colored background. The colors are reminiscent of those found in the original artwork that inspired it. 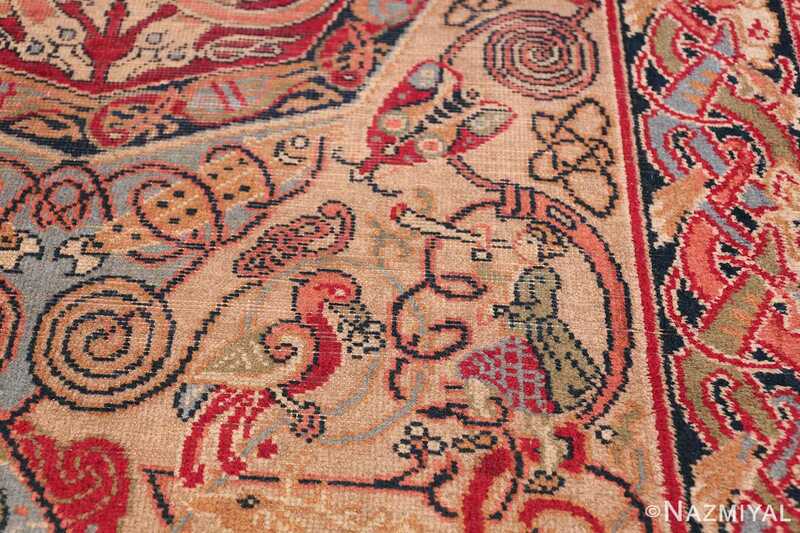 This animal design rug depicts beautifully rendered birds and wild boars that are dancing among spirals, knots and fanciful floral flourishes. 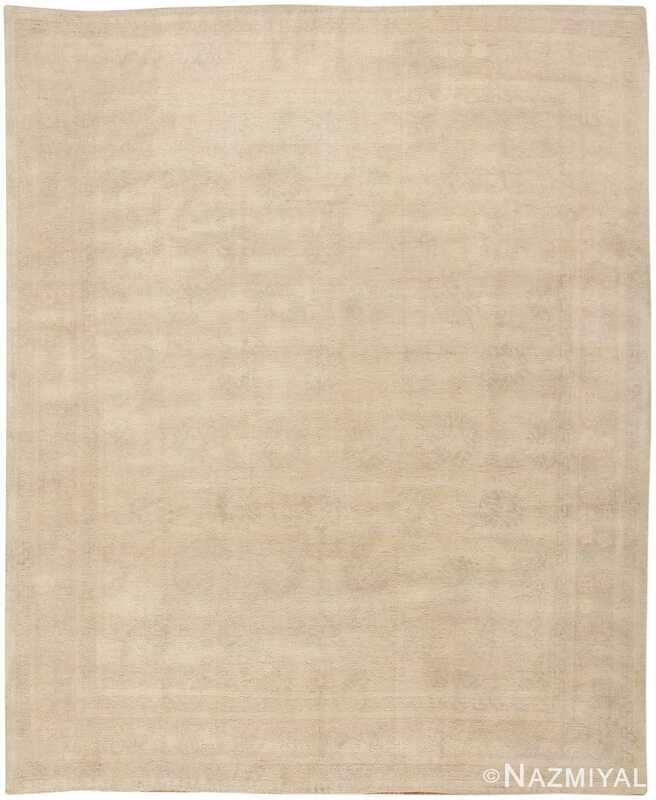 The design of this small scatter size rug is reversed on the vertical plane, which makes it able to be viewed from either end. 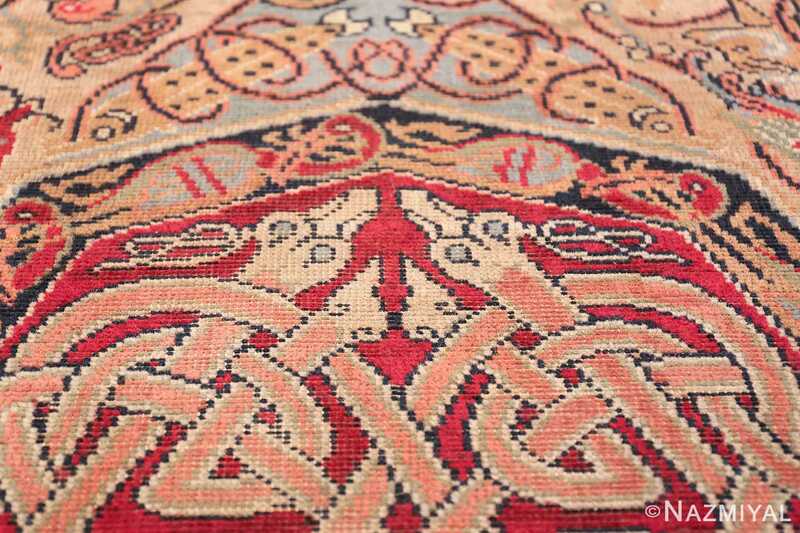 The border that surrounds the field of this Small George Bain Celtic Hunting Rug, creates a fascinating frame for the central design. 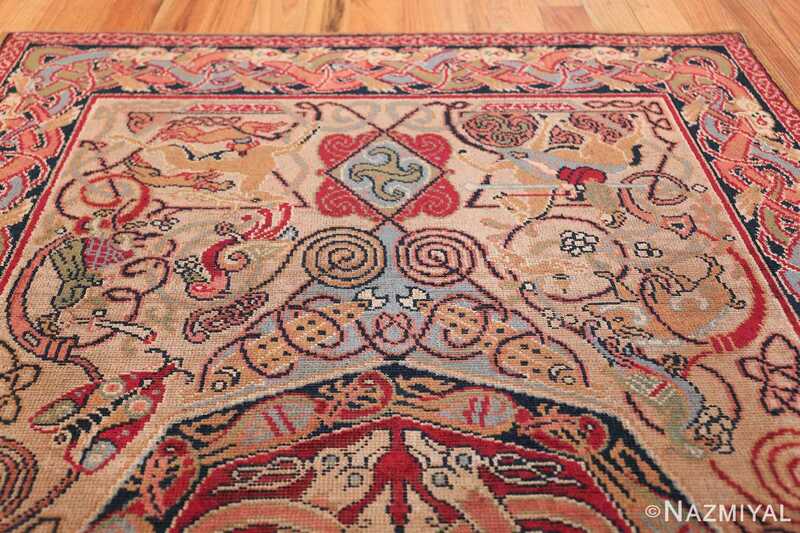 That said, the border also has its own uniquely interesting features and characteristics. 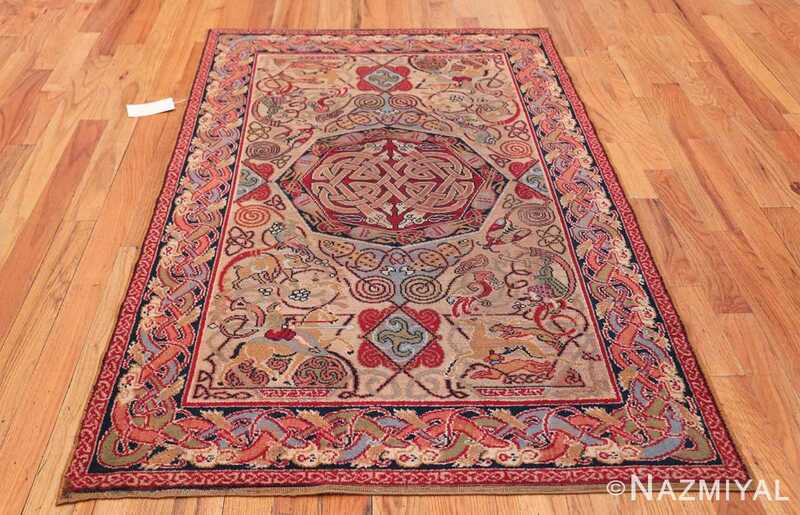 The intricacy of the borders and the central design assure that neither one overshadows the other. They both stand out as important elements of the design. 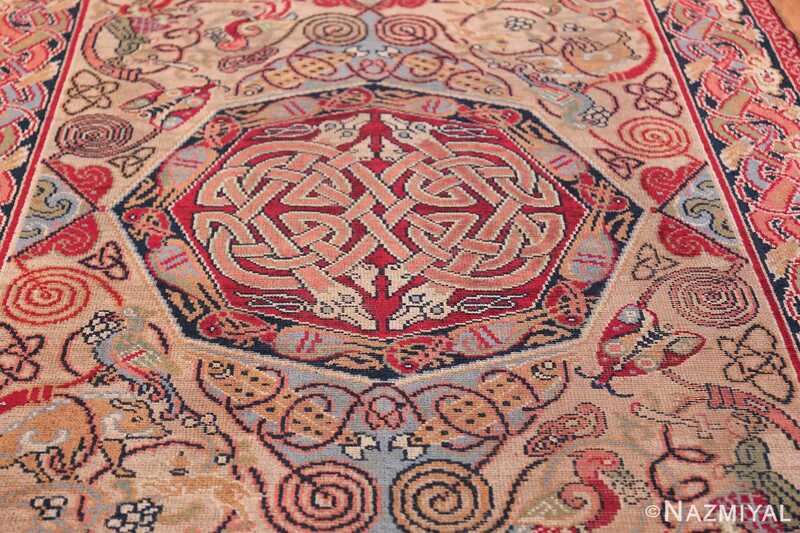 This beautiful classic artist rug is part of a Celtic knot work revival that took place in the mid-20th century. 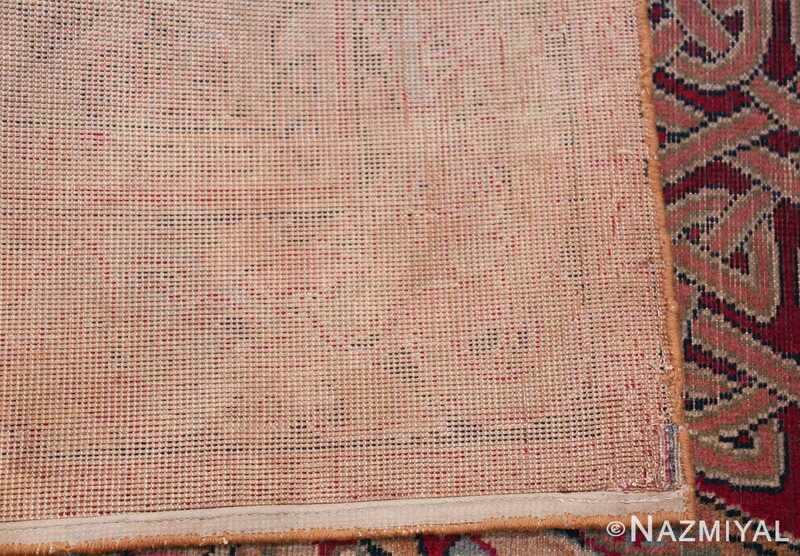 It is a versatile decorative rug that gives a sense of formality to any interior decor. This fascinating and unusual small George Bain Celtic hunting rug is one that any lover of Celtic art and history would cherish for a lifetime. 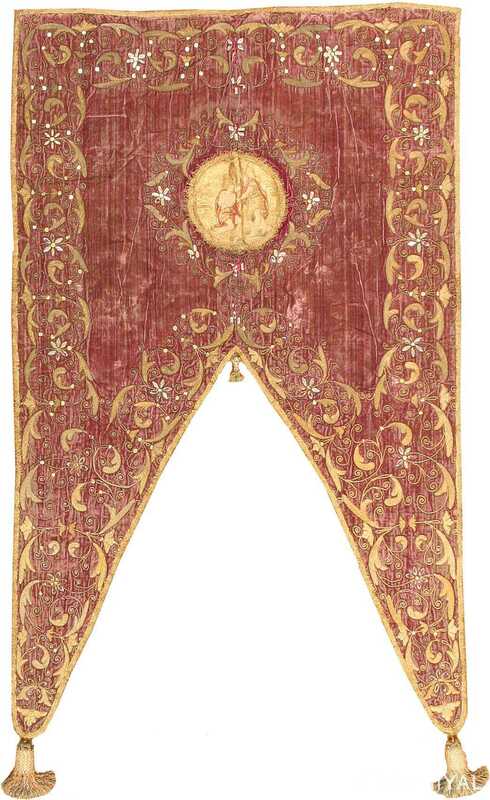 Woven in Italy, this velvet textile piece features a repeating floral pattern set over a burgundy field.